Whenever it comes to creating an e-commerce website, the duo of WordPress and Woocommece is one of the most common things that we use. Since both of the things are extremely easy to set up and extremely easy to maintain we often tend to go with this combination instead of choosing other options. However, both of these things lies in the backend. What about the frontend? The user experience and theme are the utmost priority when designing an e-commerce website. The front end needs a theme which can give your e-commerce website a personalized look. But when it comes to themes, there are quite a lot of options are available out there. In this article, we have handpicked 5 Best WordPress themes with Woocommerce from Templatemonster that you can choose from. Kumartket WooCommerce Theme is one of the top WordPress Woocomerce themes that you can try out. The theme has a stunning yet clean and modern design. Along with that, you get a hell lot of widgets options. The theme is also SEO optimized and offers the support of Total cache and Autoptimize. In addition to that, you get other features like YITH WooCommerce Wishlist and YITH WooCommerce Compare support. Also, you will find some of the elegant animations on the theme and it comes with 500+ Google Fonts with Preview Capability. Hensia will be a perfect woocomerce theme if you are planning to sell furniture online. But the theme cannot only be used for a furniture store. You can also use it for the bakery website. The theme also comes with some of the cool features. Like you get the support of horizontal and mobile menu. It comes with a revolution slider, child theme support. Plus you get the cloudzoom with image slider. Like if you hover over an image, it will get zoomed out. Plus you get product overview and product quick view option. Up next we have the Styler theme. This one is a perfect option for creating a clothing store online. The theme is loaded with a bunch of features. Like you get a mobile friendly design along with the support of Elementor page builder. It also comes with 5 blog layouts, mega menu plugin, 7 amazing headers, and 3 different footers and much more. Also, the theme is retina ready. UpStar is a multipurpose store woocommerce theme which you can use for almost every store out there. With this theme, you get quite a lot of features. Like it comes with the support of WPBakery Page builder and comes with Revolution support. Also, you get to see LTR and RTL support. It also horizontal and mobile menu. Along with that, you get cloudzoom with image slider, popular product section, product hover, product QuickView and on. Furthermore, the theme is loaded with Google fonts and has touch support. In the end, we have the Coloristo theme. This theme is also a perfect option for creating a clothing store. The best part of the theme is that it offers you the support of the elementor plugin. As a result, you will be able to create responsive websites with ease. Also, the theme is SEO friendly and comes with lots of Google fonts. The theme also includes some of the powerful plugins which will help you to set up your dream website. 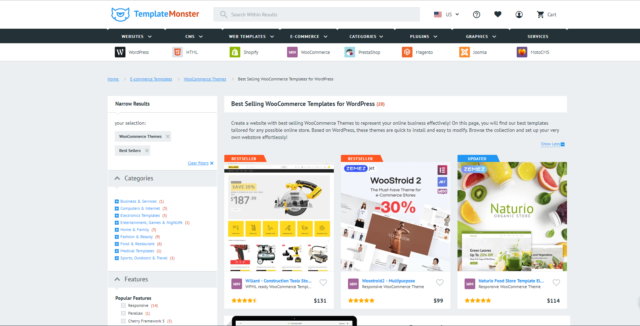 So those were the 5 Best WordPress Woocommerce Themes from Templatemonster. You can go ahead and check these themes out and see how they are working for you and then choose one. You might also want to check out the vast range of wordpress consultancy themes that they have at very affordable prices.